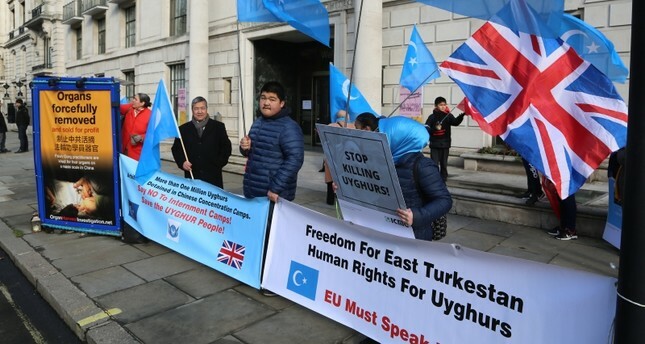 China's human rights violations against the Turkic Uyghur minority in Xinjiang Uyghur Autonomous region, also referred to as East Turkestan, have been protested across the Chinese Consulates worldwide. The Islamic Community National View (IGMG), one of Germany's largest Muslim-Turkish associations, gathered before the Chinese Consulate in Duesseldorf for protests. The organization's head Kemal Ergün made a statement and slammed China for human rights violations, religious oppression and so-called training camps. Ergün went on to say that the forced-training camps taught the ideology of the Chinese Communist Party, humiliated Islam. He alleged that those refusing the humiliation against Islam were tortured. Ergün called on the UN to step into action and impose sanctions on the Chinese government during the organization, which was participated by some 500 people despite the rain. In August, the UN Committee on the Elimination of Racial Discrimination, in a meeting held in Geneva, stated that the Uyghur individuals, who the local administrators accuse of having unfavorable political thought, in China's Xinjiang Uyghur Autonomous Region were held in political training centers. The UN body's representatives stated that up to 3 million people have been detained without any judicial decisions. Human Rights Watch had previously announced that the Chinese government was conducting a "mass, systematic campaign of human rights violations against Turkic Muslims" in China.